Babies are primed for music: One great reason to introduce your little one to music is that she is ready for it. An infant’s sense of hearing is well developed early on so exposing her to music makes sense. Additionally, babies tend to react very enthusiastically to music and song – their eyes light up, their chubby little legs start moving, they beat or clap their hands and they might start cooing or trying to “sing” in their own baby way. Music is a great way to get her senses going and no matter how young, she can enjoy it. 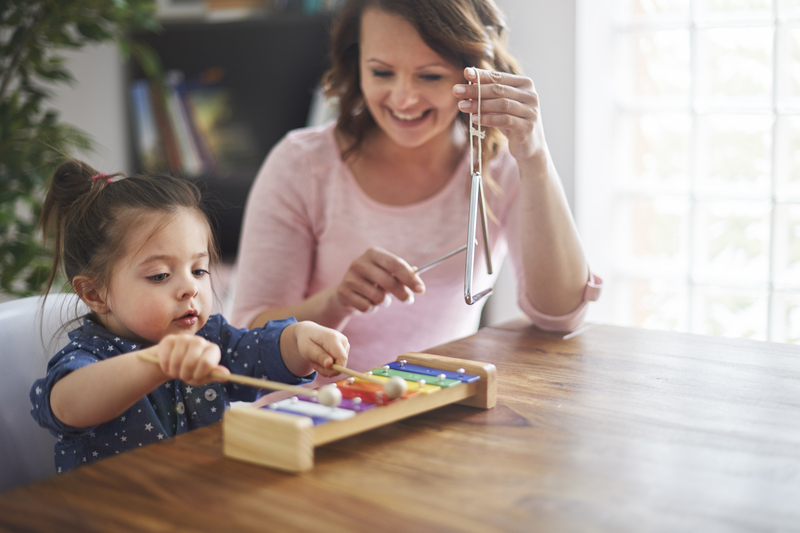 Music is engaging: Whether you’re in a Kindermusik class, singing to the radio in the car or dancing in the den at home with your baby, music is a wonderful way for you and your child to interact! Dr. Laurel Trainor, a PhD and Director of the McMaster Institute for Music and the Mind in Ontario, Canada, says that music can strengthen your relationship with your baby. Studies have shown that moving to music with another person releases a hormone called oxytocin; this is the same hormone produced during nursing and causes that mother/baby bonding. Music and dancing with your child is true quality time and can bring you and your baby physically and emotionally closer together! Music and Communication: While studies have shown that exposing your little one to music may not guarantee her admission to Harvard or lead to a Nobel Prize, there are correlations between communication skills, language and music. In 2016, research conducted at the University of Washington’s Institute for Learning & Brain Science (I-LABS) showed a link between music and speech processing. Scientists studied 9-month old babies who participated in ongoing play sessions with music. The result was that these children had improved processing skills, not only in music but also in speech, showing a connection between rhythmic patterns in music and rhythmic patterns in speech. Christina Zhao, one of the researchers told CBS News that this “study [was] the first to demonstrate that a type of enriched experience with sound other than language can influence infants’ speech sound processing.” Other studies have shown that active participation in music (such as using instruments or movements rather than just passively listening) can help increase a child’s own communication gestures and expressiveness. Play music for your baby: Yes, exposure to music – lots of different music — is good for your child. It’s no lie that classical music is more complex in sound and structure. Over time, our brains – even in babies – can learn to identify these and recognize certain pieces. Scientists consider classical music “good exercise” for our brains as it opens up certain pathways in the brain that help with reasoning and problem solving. However, this does not mean you have to only play classical music. Remember that babies are primed for music and they will benefit from listening to all types. One note: While your baby’s hearing is well developed, this does not mean you want to blast the volume. Be mindful and keep the levels moderate so as not to damage your child’s hearing. Teach your baby lyrics and sing with her: Whether it was the alphabet song, the days of the week, your state capitals or multiplication tables, at some point, all of us have learned through song. Lyrics teach your child words, rhyming, patterns and other key elements of speech. Singing in the car, at bedtime or naptime, and throughout other parts of your day is great exposure for your child and fun for you both! Start early and do it often and you’ll be amazed how much she’s learning. Keep music in your child’s life: This may be through community music classes (like Kindermusik, Mommy and Me), your local church or library. This is great time with your little one and there is no such thing as too early. The same goes if you want your child to learn an instrument. As you look towards preschool and up, many schools have active music programs — this is something that you want to advocate for and encourage. However, regardless of what happens in the outside world, you can control what happens within your home. Again, you don’t need to enlist Mozart’s great-great nephew as a piano teacher or buy a baby grand. Rather, songs in the car, playing music in your home and actively participating with your child can help her develop a life-long love of music. Chances are she’ll be a happier, more well-rounded person for it. McElroy, Molly. “Music Improves Baby Brain Responses to Music and Speech.” UW News. 04/25/2016. https://www.washington.edu/news/2016/04/25/music-improves-baby-brain-responses-to-music-and-speech/. Miller, Lori Kase. “The Benefits of Introducing Baby to Music.” com. October 2014. https://www.parents.com/baby/development/intellectual/the-benefits-of-introducing-baby-to-music/.